The Halo, the original American handpan, was influenced by instruments from Switzerland and Trinidad & Tobago. Its soft, yet highly energetic, ethereal sound, and simple playing method, are beloved by experienced musicians and novices alike. What is it about the Halo the draws people in? What mystery is held by this piece of metal resembling a UFO that inspires people to wait years for the chance to buy one? Part of it is the community of Halo musicians and avid listeners that has grown up around the instrument. Another factor is the magic of its exhilarating, yet soothing, sound. The Halo’s voice captivates all who hear it, and stops passersby in their tracks. And yet another is the freedom it offers musicians and non-musicians alike. The Halo offers a vast terrain to explore, with ethereal and unexpected sounds and timbres awaiting the personal touch of anyone who plays it. The Halo provides that rarest of gifts, creative freedom. There are no rules in Halo play. The only limits are what each player confines themselves to. At Pantheon Steel we feel part of our mission is to preserve that creative freedom for people. People often ask us for lessons or tips on how to play their Halo. Our advice is simple and consistent: allow the Halo to teach you. Few other instrument types in this world are such a teacher. We are grateful to be able to contribute one. In 2005, engineer and machinist Jim Dusin witnessed Kyle building a steelpan by hammering it into shape with a combination of pneumatic and traditional hand hammers. The loud and intensely laborious process of creation he witnessed left Jim shaking his head in disbelief, or rather belief: belief that there had to be a better way. From that moment together Jim and Kyle sought to create a new, more consistent and efficient process to automate the formation of the instrument’s shell (first the steelpan, later the Halo). The approach was modeled after Kyle’s own hammering protocol, philosophy, and goals, something every steelpan maker evolves for themselves. Great lengths were taken to bring something new and vital to the table. The process married a motorized turning axis, which rotated a steel sheet, and a roller bearing attached to a computer-controlled hydraulic arm. The specific stresses applied to the steel sheet as it was turning, modeled in its “roll program”, directly replicated Kyle’s pneumatic hammering process, which Jim studied at great length. They called the resulting process the Rolling Method, and later patented it. The original Halo’s sound was rooted in how this Rolling Method turned Kyle’s hand-forming techniques into a contemporary automated process. But this was just one factor of the Halo’s unique sound and feel. What else contributed to the its originality? 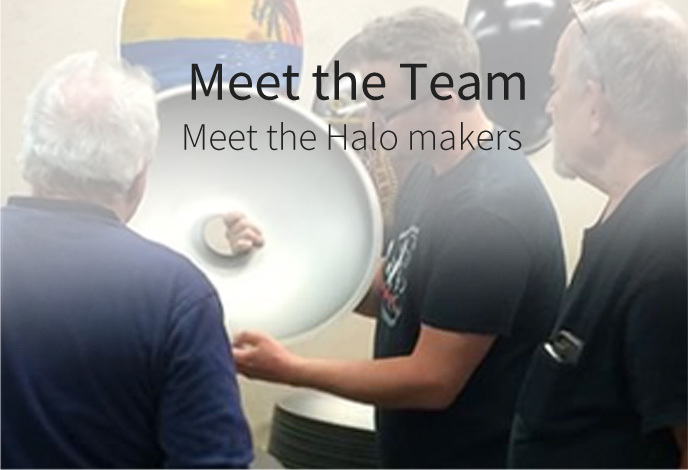 The Halo debuted a new class of handpan, thanks to being two inches larger than the original. While at that time the lowest central note available on a similar instrument had been the note D3, the Halo distinguished itself from the start by offering a central C3, giving it a very different feel. Until 2011, this C3 was the only center note offered on the Halo. Though only two half-steps lower in pitch, this C3 – supported by thicker steel (discussed below) – gave the Halo a massive gravity, or perceived weight, which defined the instrument’s sound. It felt and sounded like something unexpected and new to the world. From the beginning, the Halo’s appearance has been as unmistakable as its sound. The Rolling Method, used until this new era, gave the instrument pronounced striations, which gave its surface a specific and unique personality. The Halo’s surface was also highly polished, prior to the “bluing” oxidation treatment it received, which gave it a reflective multicolored appearance. In a world grown accustomed to a non-reflective monochrome surface in instruments of its type, the Halo undeniably stood out in ‘technicolor’. In order to achieve a low center C3, Kyle felt the Halo’s steel had to be thick: thicker than anyone had used in instruments like it. Strong thick steel brings gifts, but also challenges such as instrument weight, and the incredible effort required to tune smaller, higher-pitched, notes and coax them into singing. 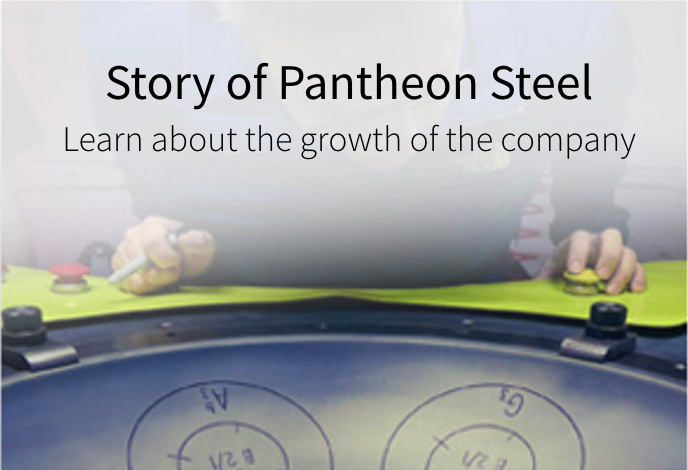 Pantheon Steel’s philosophy has always been that it’s only worth doing something if you can actually pull it off. Pulling off a stable C3 center with thick steel depended on a subtle benefit of the Rolling Method, one invisible to players: the variable thickness it provided across the shell. A “rolled” shell’s thickest steel is at the outermost edge (flange) and at the center, where the lowest central note resides. The thinnest steel is in a middle ring, where the tonefields lie. Thick center steel allowed Pantheon to successfully tune a C3, and as technique progressed, to go even lower, offering a B2. It also let the instrument absorb far more energy than anyone had experienced. The thinner steel supporting the tone fields in the tone field circle made these higher notes resonant and easier to work. In addition to its mechanical properties, variable thickness also gave the Halo a subtle but distinct tone. Strong and loud, the Halo was truly a novel sonic platform with its own voice. Its masculine physicality, unmatched projection, and unique timbre offered a dramatic contrast to other instruments’ more delicate physique and sound. Between 2007 and 2016, Pantheon forged new ground, and stood firmly on it, with the creation of its first generation Halo. The instrument gave players a bold new voice, and demonstrated that while some paths had been perfected, the basic form of the handpan provided a wide-open territory in need of exploration. Seeing what was possible, other makers would soon follow, and Pantheon Steel strove to help many find their own way. And the Halo was itself to evolve… a story which is unfolding now. The handpan, a type of instrument of which the Halo is included, is a piece of steel which, once shaped, you may think looks like a UFO with circular indentations in it. We call these indentations tone fields, the part of the handpan you generally tap with your fingers to generate sound. There’s also either an inpex or apex at the top of the handpan, which is the deepest sounding tone field. If you turn the handpan over you’ll find the “port”, the opening on the bottom of the pan which has its own flavor of sound. In some handpans, tone fields are also added to the bottom half of the instrument. Handpans are usually played in your lap or on a stand, and either solo, tandem (with four hands), or accompanied by other musicians. These instruments marry rhythm, melody, and harmony in a single flow. Part of the allure of the handpan is that you are free to play as you like. Unlike other instruments, there are no musical modalities or methods to learn, no pre-written musical scores or songs to memorize. So, the result? There are as many styles of play as there are players. The Halo is a type of Handpan. But, you may ask, what does the word “Handpan” mean? It’s a term Kyle came up with in order to differentiate the Halo and other future varieties of this new class of instrument from the original created in Switzerland. It was quite evident the originators did not want their trademarked name to be used as a generic term, so a new one had to be invented. They even asked us not to mention their instrument’s name on our website. So Kyle started thinking. He knew the mother art form of Steelpan originated in Trinidad & Tobago, and so it made sense to include the word ‘pan’ in the new name. But what else? Well, since this new class of instrument is played by ‘hand’, it soon became evident to Kyle what the new term had to be – “handpan”. “Handpan” is the most widely used name to describe this class of instrument. Others have sought to replace it with other terms, some more elegant sounding, but the word “handpan” has been adopted by the vast majority of the worldwide community as it perfectly describes what it is; a hand-played piece of vibrating steel which ultimately originated from the Steelpan art form of Trinidad & Tobago. “But didn’t it originate in Switzerland?” you ask. This is a common misperception. All handpans are made on the shoulders of the steelpans first created and innovated in Trinidad & Tobago. However, as indicated in the documentary Hang: A Discrete Revolution, the first inspiration to turn the steelpan into a hand-played instrument came from a Swiss percussionist named Reto Weber. He provided the idea to the original makers and, in turn, the first handpan was born.